Medicine balls are fun to use. You can use them for about any training objective you wish to accomplish. You can hold them, throw them and even catch them (you’ll be doing some medball catching in this workout). Using a medball can allow us to work on non-traditional or non-linear movements. Take a medball clean 0r wall balls for example. Both of these exercises requires to throw or to let go of the load (the ball) momentarily. We couldn’t do this with a dumbbell or kettlebell. We would obviously get hurt. It also allows to absorb impact or to decelerate force, this is useful for athletes or people who work in law enforcement. Using medballs is a great way to escape the monotony of just using machines. 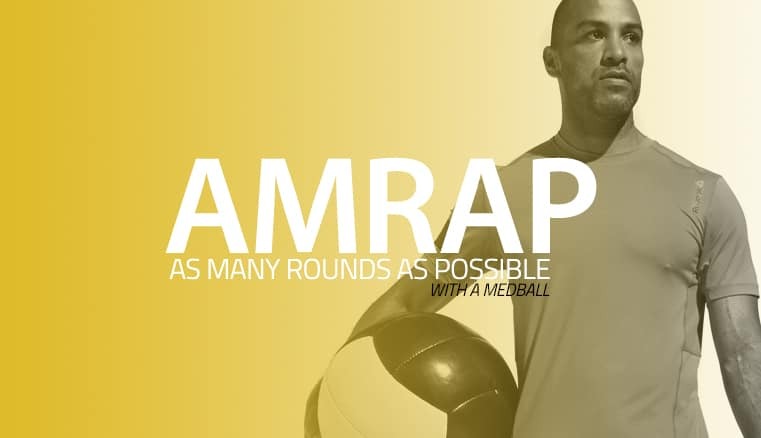 Using medballs requires coordination, focus, agility, strength and sometimes power. The goal of this particular AMRAP is to use whole body movements that require strength and coordination. The workout will also involve a bit of core training as well. You’re going to have to set up a timer for this 12 minute AMRAP. Meaning you will perform As Many Rounds As Possible using the exercises listed above. Since this is a relatively short workout, there should be little, to no rest in between movements. Wall balls are a fantastic movement that will not only burns tons calories, they will also target your hips, glutes, quads and shoulders. Grab a medicine ball and get close to a wall with your feet about shoulder width apart. If you don’t have a wall to throw the ball at, you can simply shoot the ball in the air. This option is not as efficient because you probably won’t throw the ball straight up all the time. And you don’t want to waste time by simply chasing the ball. There are different types of medicine balls, use one that is accessible to you but for catching and throwing purposes, the big soft medicine balls are the best ones. Sit ups are so 1996. Try Medball Sit Up Throws instead. I would suggest to grab a medball that’s anywhere between 5-10 lbs. Again, just like in the previous example, you’re going to need a wall. If you don’t have a wall maybe you can have someone help you with this portion of the exercise. Using an ab mat for this exercise is not required, but it can support the curvature of your lower back and thus make the exercise more comfortable to perform. Using a medball can provide additional resistance to perform this exercise. The throw portion of the exercise will provide a small cardio component. Medicine Balls Cleans require a bit of practice to get right. You want to squat down with the medball, while keeping your chest upright. Then stand up quickly and extend your hips completely. A detail to keep in mind is that the medball should travel very close to your torso as you extend your hips. And you shouldn’t curl it, rather you should shrug your shoulder at the top of the exercise so that you can land underneath it in a front squat position. Medball Russian Twists will target your abs and your hip flexors. They’re fairly simple to do. Try to remain up right through out the exercise. You don’t want your posture to collapse at your thoracic spine. If the exercise becomes too demanding or your lower back starts bothering you, then simply place your feet on the ground instead of leaving them up in the air. Do you usually train with a partner? If so you’re going to enjoy this one. I’m going to post more medicine ball partner workouts in the near future. You’re going to need a wall for this one. Use a partner if you don’t have a wall to throw the ball to. This movements resembles a burpee. 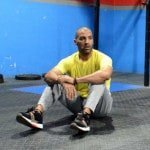 As you have probably noticed from the above videos, I really enjoy using medicine balls to get a great cardio workout in.